3. 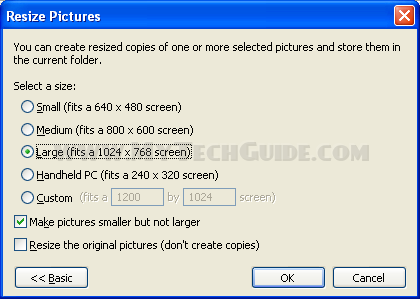 Right click on image that you want to resize and select “Resize Pictures”. You can select multiple photos by holding left CTRL key and left mouse click. Whatever size you select, don’t worry about photo aspect ratio, it will remain the same. 7. Click OK. Processing will take from one second to few minutes depending on your computer speed and number of photos you selected. 8. Original photos will remain the same, and new smaller photos will appear in the same folder only renamed. For example, if original photo is named “MyPhoto.jpg”, resized one will be named “MyPhoto (xxxx).jpg” where “xxxx” is “Small”, “Medium”, “Large” or “Custom” depending on size selected. When sending email make sure that you attach smaller images with “(xxxx)” in their name. But I will agree that for non-technical users, having a standalone resizer is a very good idea. One quibble with your article: I think 1024 by 768 or 100 KB is still too big. Go for 800 by 600. Your recipients will appreciate that. Another option is to use the Fluxtools web-based photo resizer/emailer at http://www.fluxtools.net ! Hi my loved one! I wish to say that this article is awesome, great written and come with approximately all significant infos. I would like to look extra posts like this . Hi there very nice blog!! Man .. Excellent .. Wonderful .. I’ll bookmark your site and take the feeds additionally?I am satisfied to find numerous useful information here within the post, we’d like work out more techniques in this regard, thank you for sharing. . . . . . I loved as much as you’ll receive carried out right here. The comic strip is tasteful, your authored material stylish. nonetheless, you command get got an edginess over that you want be delivering the following. unwell unquestionably come more until now again as exactly the similar just about very often within case you defend this hike. Hi there, I discovered your web site by means of Google while looking for a related matter, your website came up, it appears to be like good. I have bookmarked to favourites|added to bookmarks. I have learn several excellent stuff here. Definitely worth bookmarking for revisiting. I wonder how so much effort you put to make one of these fantastic informative website. A number of them are rife with spelling issues and I find it very bothersome to inform the reality nevertheless I will certainly come back again. like yours. It is pretty prie sufficient for me. Personally, if all web owners and bloggers made excellent content as you probably did, the internet might be much more useful thqn ever before.